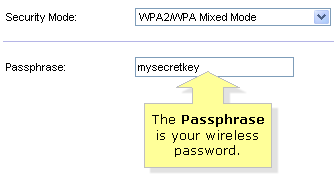 Once you have set up your Linksys Wi-Fi Router using Linksys Connect, a unique name and password for your wireless network will be generated automatically. This makes it easy for you to identify your network. 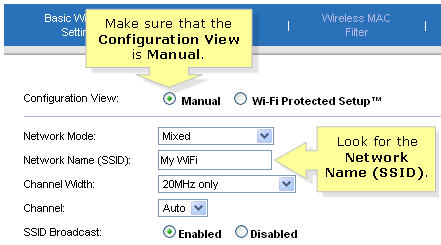 On the Linksys Connect main screen, select Router settings. NOTE: Connecting additional computers to your main wireless network is different from connecting computers to your Guest network. To know more about the difference between adding a second computer and connecting a computer to the Guest network, click here. You can click on Change to personalize the network name and password. For detailed instructions, click here. Now that you have the Router name and Password, you are ready to connect your wireless computers and devices to the network. To learn more about connecting your wireless devices, click here. Launch a web browser like Internet Explorer. In the Address bar, enter “192.168.1.1” as the router’s default IP address then press [Enter]. If this doesn’t work or if the IP address of your router has been changed, enter it instead. Enter “admin” in the Password field then leave the User name blank. 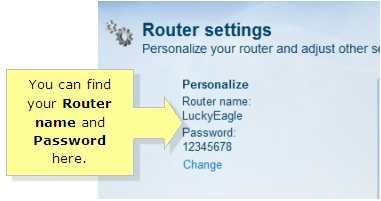 If you have set up a User name and Password for your Linksys router before, enter your personalized credentials instead. QUICK TIP: For Linksys Smart Wi-Fi Routers, you can enter “http://myrouter.local” on the Address bar to access its web-based setup page. Click when a Warning prompt that says,” Using this advanced utility to change your router settings could disable your network” appears. If the configuration view is set to Wi-Fi Protected Setup™, you can see the Network Name (SSID) and Passphrase on the same page. However, if the configuration view is set to Manual, you will see the screen below. Click Wireless Security to view the security settings of your wireless network. Take note of the Security Mode and the Passphrase. NOTE: For the example above, the Security Mode used is WPA2/WPA Mixed Mode. The Router name and Password are also called Network Name (SSID) and Passphrase. QUICK TIP: It is best to write down the wireless settings of your Linksys Wi-Fi Router on a piece of paper for your future reference. 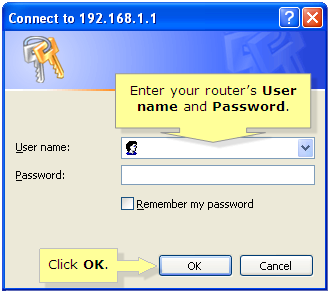 Now that you have the Router name and Password, you are ready to connect your wireless computers and devices to the network. To learn more about connecting your wireless devices manually, click here.